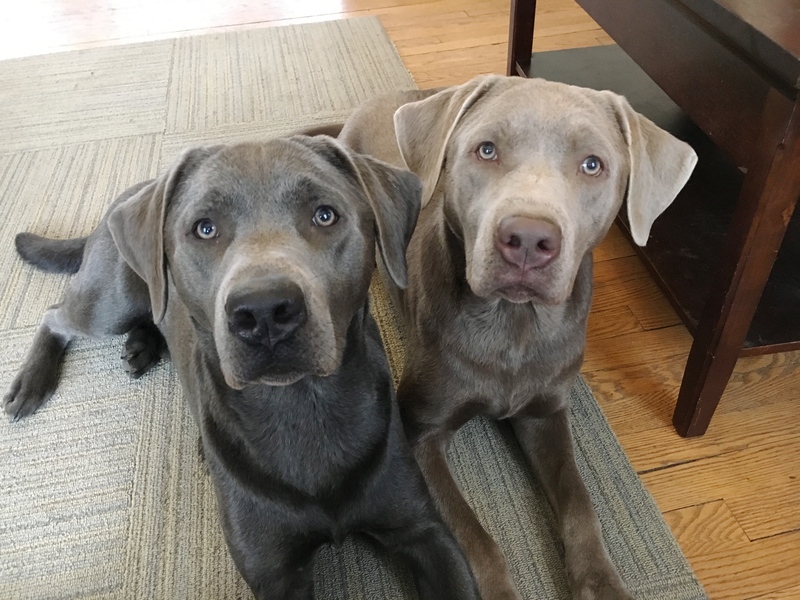 Godzilla and Gossamer are a pair of a ten-month-old labrador puppies. The brothers were adopted together into the same Omaha home. Their guardians set up a puppy training session with me to help train the pups to stop getting over excited, stop nipping, stop jumping up, stop barking, mouthing and digging. This pair of very excited brothers did some serious dog barking to greet me as soon as the door opened. They then proceeded to take turns jumping up on me. I immediately realized I was going to need to show the dog’s guardians how to calm down the dogs and not get overexcited when they hear a knock at the door. There were two reasons the dogs acted this way; a lack of structure and the humans petting the dogs any time they invaded the human’s personal space or jumped up on them. Any time you pet a dog, you are rewarding whatever it happens to be doing at the time. If a little puppy jumps up on your shin and you pet it, you are saying “to get attention from a human, jump up on them.” What is cute at 6 lbs is not as cute at 60. I shared a number of puppy behavior tips and dog training secrets with the guardians as well as suggesting a number of rules and boundaries. These dogs are almost petulant due to getting what they want often and the guardians not correcting them in a consistent way. While the humans were objecting to really egregious behaviors, the lack of rules made these inconsistent which makes it more challenging for a dog to learn. Once the guardians started using communication methods the dogs understood, consistently with good timing; the dog’s behavior starting improving. They stopped nudging the humans for attention, were showing respect for their space and listening to commands and corrections right away. Because the dogs are still puppies, it shouldn’t be difficult to modify their behavior and eliminate unwanted puppy problems for good.